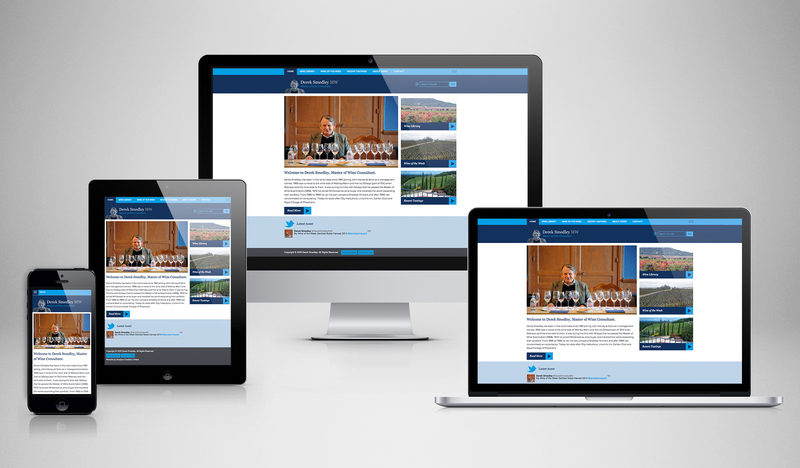 As part of a collaborative Studio A project, Greybox Creative have designed a brand new website for Master of Wine Consultant, Derek Smedley. With over 50 years’ experience in the wine industry, Derek Smedley’s love for wine has not only given him the opportunity to establish his own company and act as the 1977 Masters of Wine Chairman, but to also become a distinguished consultant for over fifteen prestigious clubs around London. Derek Smedley hired Greybox Creative to design a website that could showcase his vast knowledge of wine, whilst educating and recommending his favourite beverages to fellow wine enthusiasts. To achieve this, Greybox Creative ensured that the website was user friendly by including six navigational page tabs at the top of the site. The ‘Recent Tastings’ and ‘Wine of the Week’ pages were designed in a blog/news style for Derek’s regular updates. To create the ‘Wine Library’, the team had to import data from Derek’s previous site as it categorises wines from all over the world by global region. An online editing feature was attached to this page to ensure Derek can add and edit his library in the future. Together, Studio A have created a smart and refined website with a responsive design that allows Derek’s clients to easily research wines from all over the world on a device of any size.